In December 2011, the Life Sciences Strategy made a commitment to ensure that the UK becomes re-established as a global leader in the science sector. Alongside his promise came a ten-year Strategy for UK Life Sciences that has so far contributed £50 billion to our economy and has provided 165,000 UK jobs. The initiative merges together key strengths of British science: basic science at universities, clinical research, industry, and the National Health Service (NHS). The UK government is committed to making clinical study start-up more efficient by investing in health research infrastructure and encouraging patient participation in research studies. The ECMC Network is one such initiative, developed to complement existing national efforts, and to speedup the flow of innovation from the lab bench to patient’s bedside. The ECMC has a continued working relationship with the Health Research Authority (HRA) to implement a new simpler, streamlined regulatory approval process for clinical trials. A component of the Trial Harmonisation programme will bring a single technical pharmacy and radiation review process to avoid duplication of review at individual NHS organisations. Experimental medicine provides the environment for clinical trials to progress through the drug development pathway, and ultimately provide patients with access to new agents. The ECMC Network is compromised by 18 adult and 11 paediatric centres of excellence, and affords research with the patients and expertise required to demonstrate and validate new discoveries and treatments borne through experimental medicine. Each ECMC location is a partnership between NHS Trust(s)/health board and a higher education institute(s), which enables the best health researchers and clinicians to work together to generate novel approaches to cancer treatments. 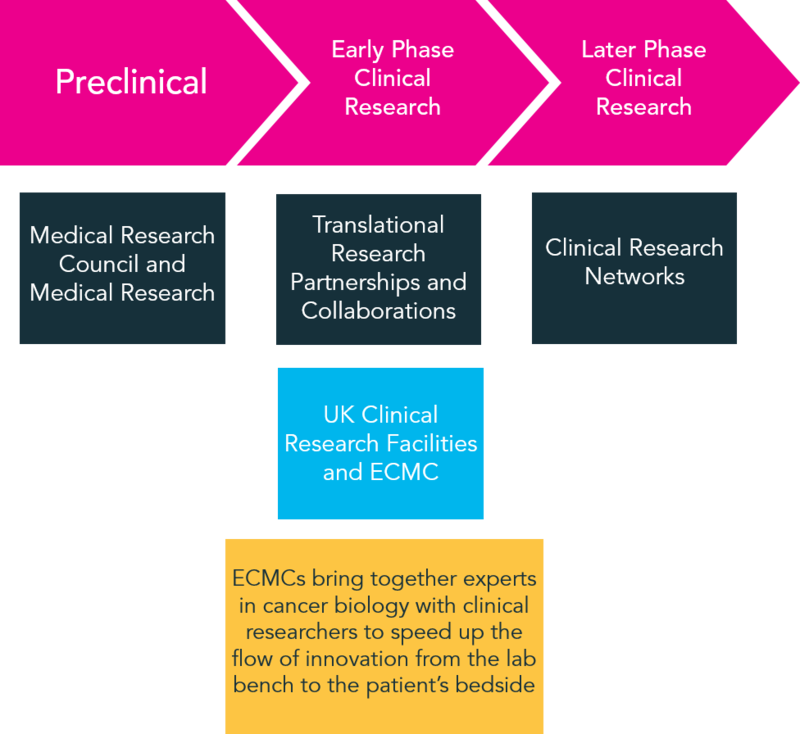 The ECMC Network allows a variety of capabilities and expertise to be combined in a synergistic way to enhance the development of new therapies for a wide range of cancer types. Diagram adapted from UKTI leaflet from January 2014. The Experimental Cancer Medicine Centre initiative is jointly funded by Cancer Research UK, the National Institute for Health Research in England and the Departments of Health for Scotland, Wales and Northern Ireland.